Tiny Forklift Does Your Bidding! When we were little kids, we played in sandboxes with toy steamshovels, drove die-cast dumptrucks, and stared in awe and wonder at the heavy equipment at construction sites. Is it the desire for demolition that drives our fascination with heavy equipment, or is it something deeper? Do we secretly long for a world where machines do our bidding? Of course we do, but we have learned from the lessons of Battlestar, haven't we? 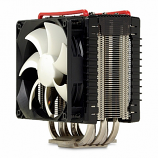 This tiny machine does all the heavy lifting for us, if by heavy we mean a few ounces. Still, it's a fun way to relive our childhood by playing with forklifts like we've always wanted to! Radio controlled, this little guy tootles around your desk, lifting and moving stuff from one place to another. Bring me my highly caffeinated beverage, now! 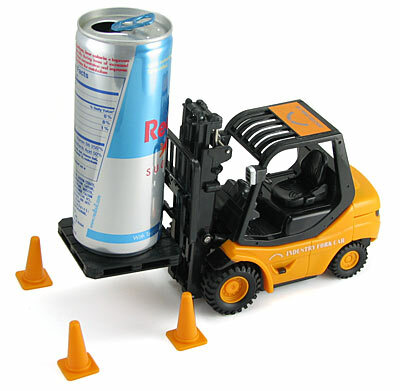 The R/C Forklift takes 4 AAA batteries, and a 9 volt battery (not included) in the controller.